Kareem. The name stands alone. Everyone knows who you’re talking about. After all, when you are the NBA’s all-time leading scorer (38,387) some 26 years after you played your last game, well, people just know your name. In the case of Kareem, they also know your shot: The skyhook, which was practically unstoppable and positively unblockable. He’s an icon. Standing at 7’2”, Kareem Abdul-Jabbar played for 20 years in the NBA, winning 6 championships, and is considered by many to be the greatest high school player, and college player, in basketball history. Of course, his talents reach well beyond sports to successful forays into acting, writing and, as of 2012, a role as U.S. Global Cultural Ambassador, selected by Secretary of State Hillary Clinton. 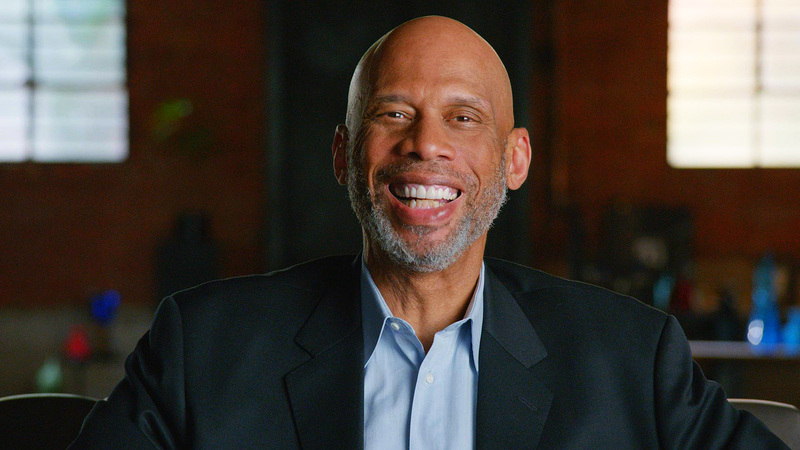 With his latest endeavor, a documentary called Kareem: Minority of One on HBO, Kareem Abdul-Jabbar allows his fans and friends insight into his life most have never seen or heard before. The Overhead Compartment caught up to Kareem Abdul-Jabbar and spent the entire interview in awe of this amazing, talented, and really tall basketball legend. The Overhead Compartment with Kareem Abdul-Jabbar begins now…. OC: Your new film for HBO is the first time you are telling your story in your own words. Why was this the right time to do that? KAJ: I’m at an age and time in my life when I think it’s important to set the record straight for the sake of my family and my fans. I felt that I didn’t want to be a mystery man as my legacy. I’ve lived a very full but complicated life that isn’t typical of a professional athlete. OC: What message are you hoping your fans will take away from it? KAJ: I hope they will get and idea of what motivated me to take the stands that I did. I came of age as a man and athlete during some of the most turbulent times in American history. Because of the Vietnam War and Watergate, America’s youth had lost faith in traditional values and political leaders. Civil Rights and Women’s Liberation were challenging the way we looked at society. The fact that I chose to engage in these political and social movements alienated some fans, but I felt it was my responsibility as a black man and as an American to support these chages. OC: What percentage of people who recognize you do from your role in Airplane? KAJ: Quite a few, especially when I am in airports. They are a very vocal and enthusiastic group. They love to repeat the dialogue and act out the scene. I can’t help but be pleased that I entertained them so memorably. And I can’t help but appreciate how excited they are to re-enact the scenes. OC: What one moment from your long, brilliant basketball career do you think about most often today? KAJ: I honestly don’t think much about my own career. I loved playing and I loved being part of a team, but it’s not healthy to dwell on past achievements because it keeps you from focusing on all that you could do in the present. I’m much more focused on my writing articles and books and making films. I also am involved in promoting education and cancer awareness. OC: What special provisions do you need to make due to your height when you travel? KAJ: People are always warning me about low ceilings or low doorways and other obstacles to my height. But I’m so used to navigating through a slightly shrunken world that I don’t require any special provisions. KAJ: The only thing I absolutely must have is a king-size bed. It would be great to have a shower head that adjusts to my height, but that isn’t always possible. KAJ: Because of my long legs, I have to travel first class. Even then it’s a bit challenging for me to get comfortable. OC: You’ve traveled all over the world playing basketball, what was your favorite city to visit? KAJ: I have enjoyed most of the cities I’ve traveled to because each has such a unique personality. Because I’m such a history buff, each city is like a history party to me. I learn everything I can about every place I visit. Having said that, Paris is still my favorite because of its rich history, fascinating art, and just the whole romance of the place. Editors note: This interview was conducted prior to the tragic events in Paris. OC: What would you do during your downtime? KAJ: I read a lot. I’ve always been a voracious reader of history and mystery novels. I also start each day by reading the New York Times and LA Times. OC: How did those reading habits help your basketball career? KAJ: Reading is rewarding in so many ways that aren’t obvious at first. On a purely physical level, I found it very relaxing. But it also sharpens your mind and makes you much more aware of your surroundings. It also helped me read other players better. OC: Which city has the most passionate basketball fans? KAJ: A toss up between Boston and Philadelphia. Both cities’ fans are passionate, enthusiastic, and sports savvy. They not only support their teams but they are knowledgeable about sports. Of course, my heart is still with Los Angeles because of the enormous outpouring of love I’ve always felt from them, not only when I played for the Lakers but ever since. OC: You’re known for your famous “skyhook” shot. Is there a player in the NBA today that could adapt your famous move? KAJ: None seem to be interested, which is weird because it’s such an effective shot that is difficult to defend against. But it does take a lot of practice to perfect and maybe players today aren’t willing to put in the time to add it to their arsenal. OC: Did that shot ever get blocked? KAJ: Once or twice. But not too often. Once I lifted my arm up to shoot it, the ball was over everyone’s head and therefore difficult to block without goaltending. OC: What advice would you give to aspiring young basketball players that have dreams of playing in the NBA? KAJ: Learn the fundamentals. Kids watch the pros and suddenly they all want to be superstars, dribbling between their legs, whipping behind the back passes, and so forth. That may get you noticed but it doesn’t, on its own, win games. That requires teamwork and making smart choices instantaneously. To do that you must drill on fundamentals until you can make the right choices without thinking. KAJ: …Is that I wanted to play piano. I was raised by my father with a love for jazz and sometimes I can picture myself in a smoky club, playing piano with a small jazz band while the audience looks on in dreamy appreciation. Kareem Abdul-Jabbar, please use care upon departure as items may have shifted in The Overhead Compartment during our journey. Thanks for choosing us for your travel tips! Have a wonderful day!